I’m back from a quick trip to visit my family in Monterrey. Had a great time seeing them and catching up with old family friends as well. There is so much I didn’t get a chance to do but must plan another trip. 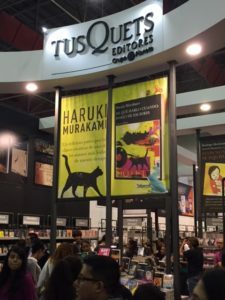 I only had a limited time to spend at the Feria Internacional del Libro (International Book Fair) but the three hours we were there were lots of fun. The fair goes on for a whole week and they have events for children, readings and book signings and of course lots of booths to visit. I saw booths from Penguin and Harper Collins but I tried to look through other publishers that I’m not as familiar with and are not easy to find here in the U.S.
One of my favorite booths was by Gandhi bookstore. They have a very nice shop in Monterrey but as I wasn’t going to go to the bookstore on a separate visit I figured I should take advantage then and there. I’m glad I did as I found a book I had to have, Despues del Invierno by Guadalupe Nettel. I really need to get more acquainted with contemporary Mexican authors. Another that was so interesting was the Editorial Atisbo. 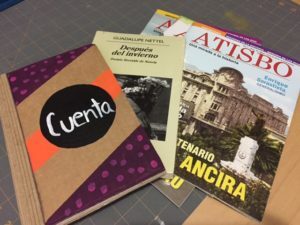 They are actually a magazine publisher but they focus solely on history of Nuevo Leon. We had a great chat with one of the reps from the booth and I had to buy a four magazines. I’ll be sharing them with my mom as I know she’ll get a kick out of them. One of the editions that I was so excited to find has a feature story on the Hotel Ancira. This famous hotel has been around for more than 100 years and although I have never stayed it has a special place in my heart because that was the first hotel my dad worked at as he began his career as a chef. Finally, the last goody I picked up was also from another booth I really enjoyed and that was Regia Cartonera. They also publish some poetry and short stories but their main goals is to focus on recycling. All of their books are made out of cardboard and recycled materials. I picked up a journal of course and am looking forward to using it. Hopefully next time I go to the fair I’ll have a chance to hear some of the author presentations and/or at least spend more time! But it was a blast and now I get to look forward to another book fair in a few weeks as the Texas Book Festival kicks off in November. I hope you guys had a great week and I think I’ll spend the rest of this evening with my Atisbo magazines. Your dad was a chef? Hotel Ancira looks like a gorgeous hotel! It sounds like you had a wonderful trip. If I won the lottery, I would spend a year traveling around the world, going to book fairs. So glad that you have fun in Monterey! I am glad you had a wonderful time in Monterrey, Iliana. My parents always loved to spend time there. I’ve only been a handful of times, and none during my adult life. Maybe one of these days.